Fair Winds Press, 9781592338498, 144pp. Bean Sprouts Kitchen brings the magic behind Bean Sprouts’ award-winning kids’ café menu to parents, kids, and chefs of all ages. The cookbook features tried-and-true tips for making mealtime hip and healthy with 60 creative and wholesome recipes that families will love to prepare and eat! Clean Ingredients: All recipes adhere to quality ingredient guidelines. In short: no artificial anything—no artificial flavors, colors, or preservatives. Allergy-friendly Options: Bean Sprouts is known for its allergy-friendly approach. The recipes in Bean Sprouts Kitchen can accommodate nearly every dietary need, with ingredient alternatives and flexible recipes. 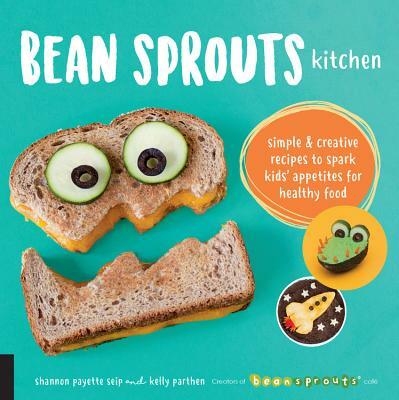 Kid and Parent-approved: Bean Sprouts Kitchen features recipe themes around what kids love—from race cars and pets to building blocks and tutus—with healthy ingredients that make parents happy. Additional recipes are inspired by Bean Sprouts’ family destination locations (amusement parks, science centers, etc. )— from edible Roller Toasters to UFOats energy balls. Child Involvement: Shannon and Kelly know that getting kids to try new tastes and eat healthy foods can be tricky and frustrating. But studies have shown that the more playful an item and the more hands-on children can be in the food prep process, the more likely they are to try something new. The book’s recipes are simple enough for children to join in the prep. Add some whimsy to your healthy family cooking with Bean Sprouts Kitchen. Shannon “Peacasso” Seip is the co-founder of Bean Sprouts, a hip and healthy café chain that focuses on families. She is the co-author of Bean Appétit: Hip & Healthy Ways to have Fun with Food (Andrews McMeel, 2010) which was named one of the Top 10 Kids’ Cookbooks by iVillage (now today.com) and has been featured on The Today Show, Good Morning America, and in nearly every major parenting publication and site. With years of experience as a morning show television anchor and writer for American Girl magazine, Shannon has written several books, including two for American Girl and was a top-ranked contributing editor of NickMom/Nickelodeon, both online and on the air. Shannon is originally from the Bay Area and now lives in Madison, Wisconsin. Kelly “Pea Brain” Parthen is the co-founder of Bean Sprouts, a hip and healthy café chain that focuses on families. She is the co-author of Bean Appétit: Hip & Healthy Ways to have Fun with Food (Andrews McMeel, 2010) which was named one of the Top 10 Kids’ Cookbooks by iVillage (now today.com) and has been featured on The Today Show, Good Morning America, and in nearly every major parenting publication and site. Green Bay, Wisconsin, is Kelly’s hometown, and she now lives in Colorado Springs, Colorado. Shannon and Kelly are touted as experts in making healthy food fun and have been recognized multiple times as one of the “Top 100 Movers and Shakers” in the restaurant industry. They visited the White House to meet with Michelle Obama’s Let’s Move! team to discuss Bean Sprouts’ role as an innovative leader in the food service industry. Shannon and Kelly are featured speakers at major industry conferences from Association of Children’s Museums (ACM) and Association of Science & Technology Centers (ASTC) to Fast Casual Executive Summit and International Association of Amusement Parks & Attractions (IAAPA). By planting their cafés in high-profile family destinations (like museums, science centers, zoos, and tourist attractions), Bean Sprouts is in front of more than 8 million visitors annually. Bean our guest and visit beansprouts.com for more.